Reilly’s Irish bakery (C-11 stand) offers up a taste of the British Isles with Bakewell tarts, scones, their triple chocolate Guiness stout cake (made with 6 pints of Guiness beer!) 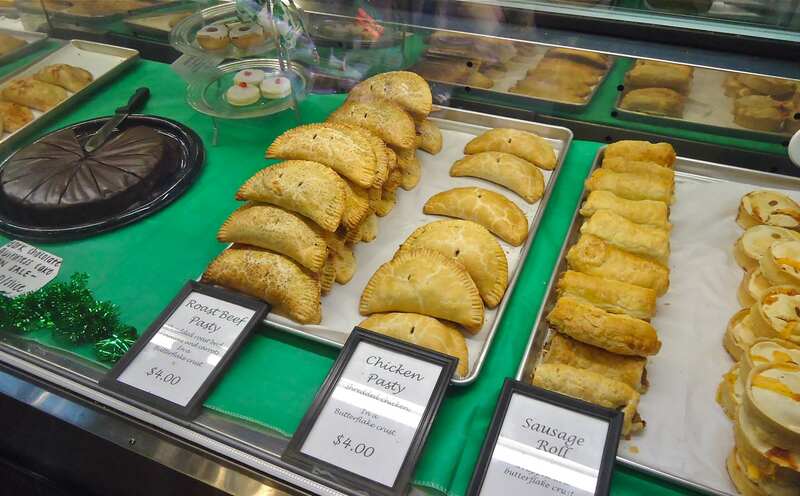 and a regional favorite, pasties… meat or veggie filled hand pies. Yum! 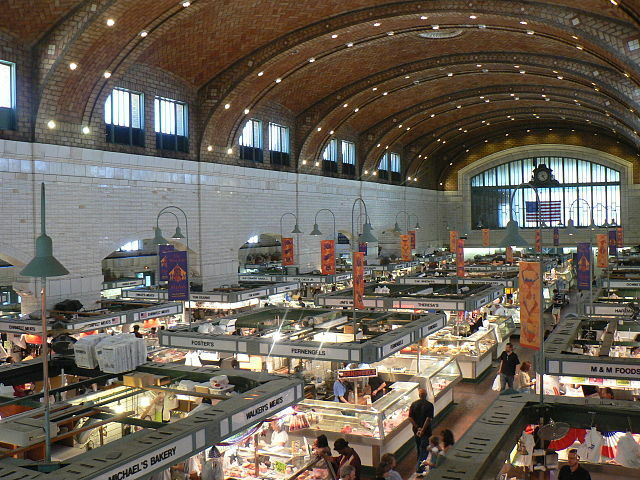 Last week at this time I was perusing the stalls of the West Side Market in Cleveland, Ohio, thoroughly enjoying the bustle of the crowd and alluring aroma of local and exotic cheeses, fresh baked bread and all manner of butchered meats. 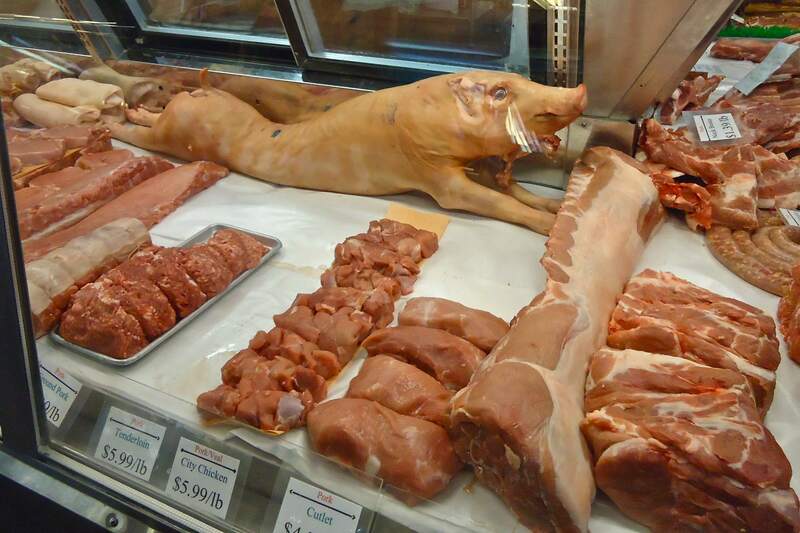 Years ago I had seen a documentary on PBS entitled “To Market, To Market To Buy A Fat Pig” (like the nursery rhyme) where several farmers markets/fresh food markets were featured, including the West Side Market in downtown Cleveland. In the 3 or 4 times I have traveled to Cleveland in the past 6 years this was the very first time I had made it to this market, and believe me it will not be the last. It is housed in a restored 1912 brick-clad building complete with clock tower and architecturally pleasing interior arches; it’s quite dramatic yet unpretentious as any good market would be. 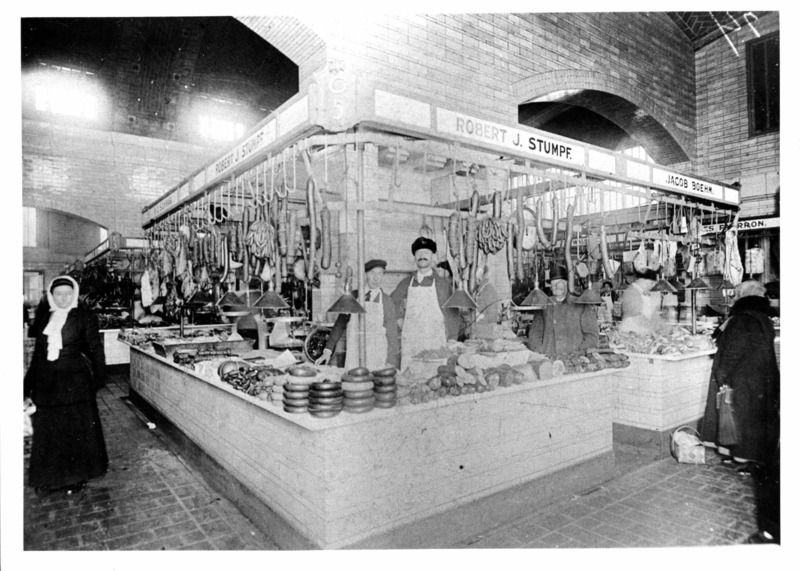 The main hall of the West Side Market. 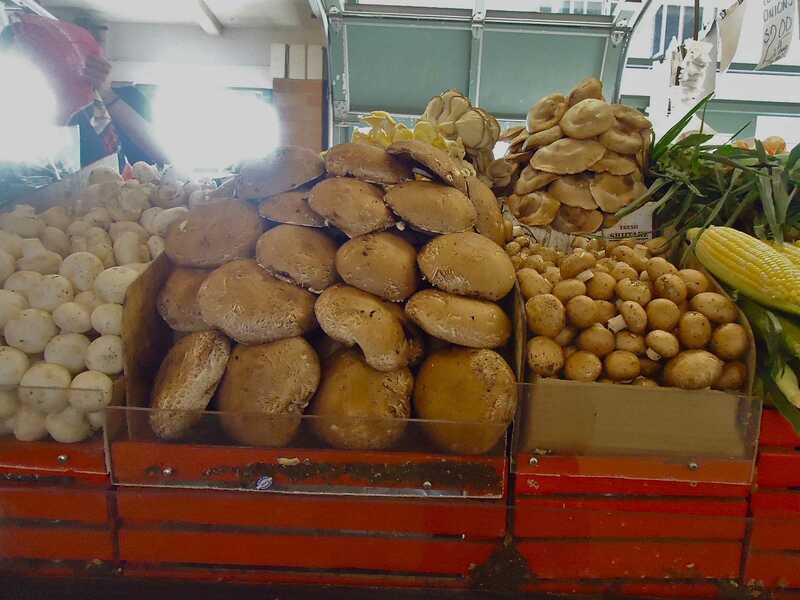 Usually there are lots of folks shopping and milling about – like most markets. Go early for the best selection and smaller crowds. Photo: Stu Spivack. My family was smart enough to allow me time to myself to wander the entire main market concourse after we all browsed the adjacent produce aisles together. I did feel there was some pressure by the produce vendors to buy something if they caught my gaze fix on any of their fruits and vegetables for more than a couple of seconds. But we were only visitors – not residents, so other than buying a half pint of plump blackberries we excused ourselves from making any produce purchases. However, in the main market I did buy a fresh dressed rabbit, beef marrow bones (I can NEVER find these at home), German style sausages (Weisswurst and Feine Mettwurst) a package of Flageolet beans and some spices. We came prepared with an ice filled cooler so we could enjoy a leisurely lunch without the fear of spoilage of our prized purchases. Speaking of lunches, I had awesome ones during this trip. The day before the Westside Market my in-laws treated us to lunch at Pier W, located in a groovy concrete (yes I said “concrete”) building designed to resemble the hull of a luxury liner cruising along Lake Erie. Well, that is, you would see that if you were IN Lake Erie or take notice of the restaurant’s self-portrait in the lobby area. 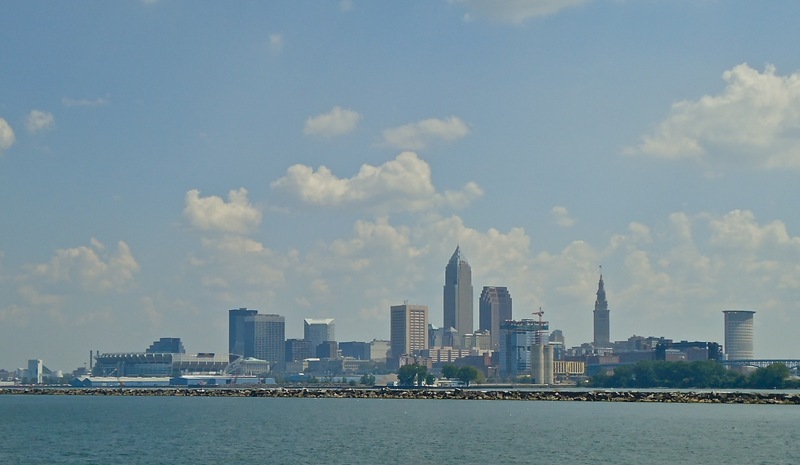 Nevertheless, you are cantilevered over the lake allowing for incredible views of Cleveland and any passing sailboats, ships, birds…what have you. Fresh meats including a whole piggy. Personally I like knowing (and seeing) where my food comes from, not only allowing me to appreciate the quality but also placing real value on the process and work involved. The food here was outstanding with local Walleye prepared tempura style gracing my lunch plate. I also enjoyed a first course of beef short rib pierogies while my father-in-law Mike and Dear Hubby had the decadent lobster bisque, which was poured into their lobster-laden soup bowls tableside. The next day was the West Side Market and we lunched afterwards at Great Lakes Brewing Company, where we dined al fresco cooling our heels with their onsite-brewed beers. Again I ordered the Walleye, a lunch special served with rice and veggies. Dear Hubby had the Brewpub’s three cheese mac & cheese with crisp pancetta and roasted chicken. Normally I am a wine drinker but when in Rome… so I tried the Ohio City Farmhouse Saison beer, made with coriander plus fresh ginger and lemon grass from Ohio City Farm. I liked it, a lot. That evening we decided on pizza at Dewey’s in Lakewood. This is a regional chain and they make a very good pizza, which I recommend especially if you prefer a thicker crust on your pie. They don’t scrimp on toppings either. 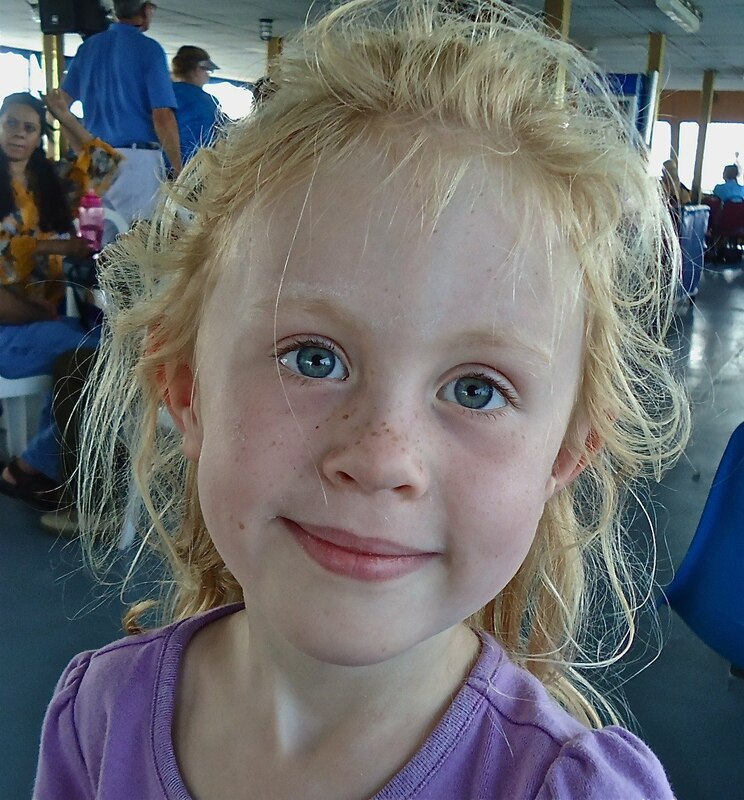 On Saturday evening we were prepared for a fine dining experience at a local Rocky River restaurant, Georgetown, so we played it smart and had a hearty, late breakfast and skipped lunch that day. Need ‘shrooms? 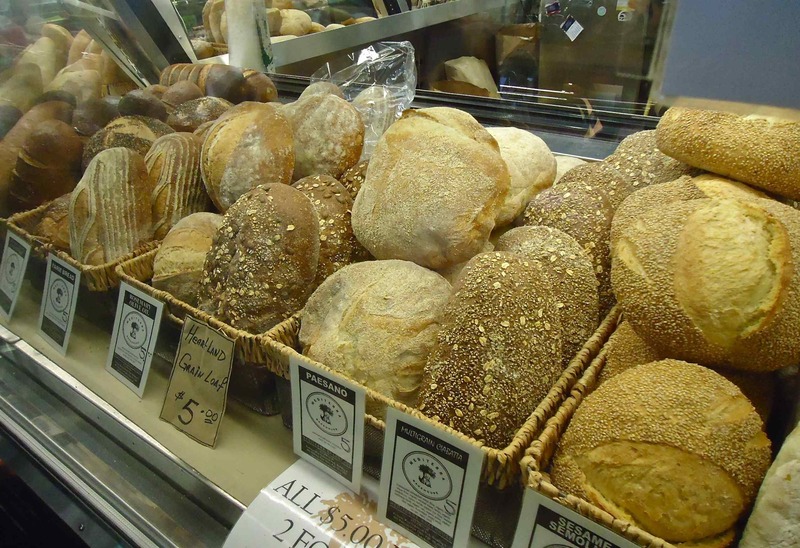 It would be no problem finding any and all varieties at the West Side Market. This was smart as I spied my favorite indulgence on the appetizer menu… Hudson Valley foie gras. I know it is not healthy, I know there may be questionable practices, however as I said, this foie gras is designated “Hudson Valley”, thus my mind was at ease. Not all foie gras is raised in the same manner but this purveyor/farm is open about their practices, which are as humane as any cage free poultry facility. I watched the Anthony Bourdain video and have read about the Hudson Valley Foie Gras farm in the NY Times. Anyway, this foie gras appetizer at Georgetown was perfectly prepared and I enjoyed it thoroughly, as I did my entrée, smoked boneless short ribs with black rice, buttermilk onion straws and watercress & apple salad along with a delectable big red chosen by Mike and Kay. Everyone at the table ordered something different and since none of us have any aversion to “sampling”, I tasted the Maine lobster pizza, the honey mustard & panko crusted grouper and more Walleye – this time Parmesan crusted and served with a mustard beurre blanc. For dessert I had the coffee crème brulee, which was excellent as well. After this outstanding dinner we all contently rolled back to the house, ready for our last day of adventure on Sunday with a quick trip to the Village of Chagrin Falls. Our meals at Chagrin Falls consisted of a double-header – first a late lunch at Yours Truly, a local Ohio-based chain that is housed in a renovated 1930’s building once a Ben Franklin Five-and-Dime, complete with checkered tile floor and mini juke boxes. Our meal here was quite satisfactory and I tried a “chicken broil”, which hit the spot. Their sweet potato fries with Tango sauce were above average, very good indeed. 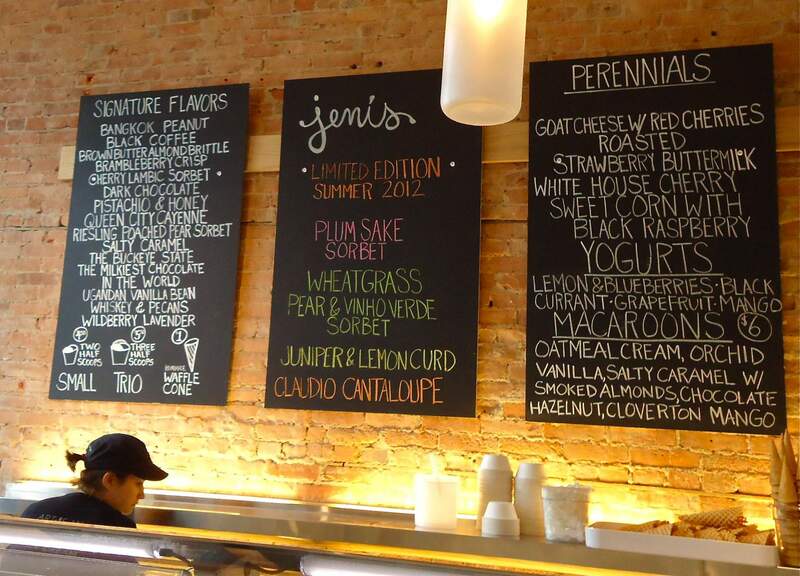 The flavor ‘board’ at Jeni’s. The hardest part was deciding what to get although they are kind to let us sample a few before making this monumental decision. 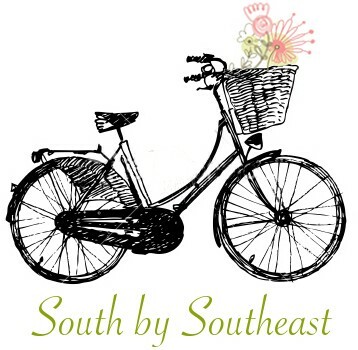 And if you can’t make it to Ohio, you can order online! The “black and tan” for the beer drinker with a sweet tooth! 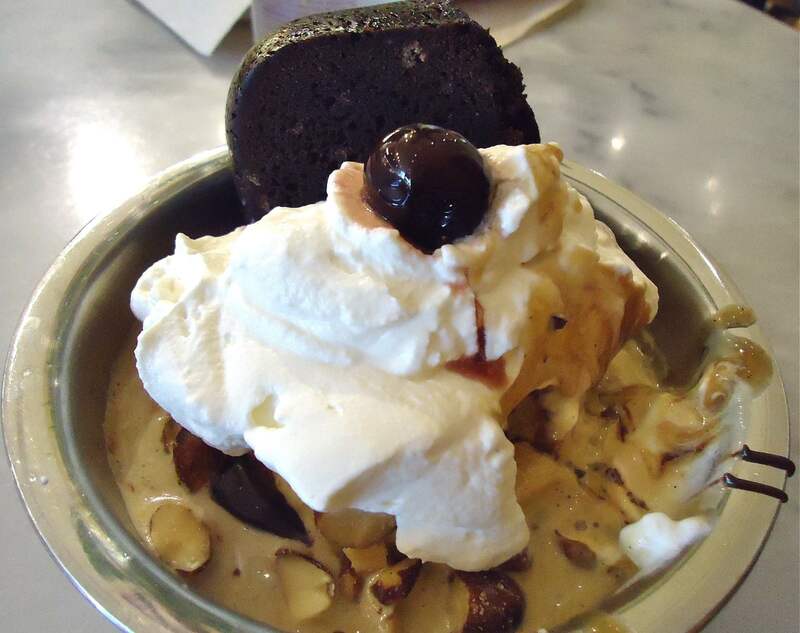 Stout-spiked bundt cake with salted caramel ice cream, chocolate sauce, caramel sauce, chopped smoked almonds and whipped cream. After a quick post-lunch stroll around town, we headed for the big foodie treat of the day, a place called Jeni’s Splendid Ice Creams. Here you can get a taste of creamy cold creativity in a cone, a cup or even nestled inside a fresh macaroon. With flavors like sweet corn and black raspberry, reisling poached pear, salty caramel or my hubby’s choice, “’the milkiest chocolate in the world’, there is some sweet concoction here for everyone. I could not resist ‘whiskey & pecans’ (wonder what this says about me?!?). Needless to say this was a foodie-fabulous ending to our trip and someone was smart to relegate it to our last afternoon there, as we probably would have found a way to stop by Jeni’s every day during our short five-day trip – it was just that great. Girly Girl thinks “Cleveland Rocks!” too. So I hope you liked my recap – and if you happen upon Cleveland in your travels, be enthused knowing you can rock it with some excellent eats in the ‘Western Reserve’. What an excellent adventure, so thanks to my in-laws. And… thank you Cleveland!